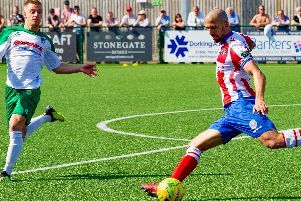 Worthing Football Club boss Adam Hinshelwood conceded his team were dealt a harsh lesson at Bostik League Premier Division title-chasers Dulwich Hamlet yesterday. Sanchez Ming, Dipo Akinyemi and Nyren Clunis got the goals as Dulwich went back to the top of the table with a 3-0 triumph at Tooting & Mitcham United’s KNK Stadium. Worthing were without top scorer Kieron Pamment, captain Darren Budd and wing-back Alex Parsons for the trip. Youngster Anesu Sisimayi made the step up in the absence of Parsons, while Joel Colbran returned in defence. The Worthing team that started at Dulwich included just two players over the age of 23 and Hinshelwood feels it is an experience his squad must learn from. He said: “This game was quite similar to when we went to Billericay earlier in the season. “We created chances but weren’t able to take any of them. Dulwich showed their quality and took the opportunities when they came to win the game. “It’s another game where I’ve come away feeling we haven’t played that badly. “What it does show is that we are not far from where we want to be but a club of our stature does not want to be losing matches 3-0 at this level. “Credit to Gavin (Tomlin; Dulwich manager), he’s done a great job with them and they are a real force at this standard. Worthing created numerous opening in the early exchanges but were made to pay for not taking their opportunities. Ming was the man to break the deadlock five minutes before the break. Akinyemi doubled Dulwich’s advantage nine minutes after the restart, then Clunis wrapped things up ten minutes later. One positive to come from the defeat was the return of defender Aarran Racine. Racine, who has been out for more than a year with an anterior cruciate ligament injury, came on to replace Alfie Young late on. Hinshelwood will be monitoring former Forest Green Rovers captain Racine’s game time between now and the end of the season but is pleased to have him as an option. He said: “It was great to be able to get Aarran back out on the pitch. He’s been incredible during his time here at Worthing. “Someone with his experience will only benefit our young defenders. His professionalism and the way he conducts himself is superb. WORTHING: Covolan; Colbran, Young, Rents; Sisimayi, Barker, Clarke, Rance; Meekums, Starkey; Newton. Subs: Pope (Clarke, 57), Racine (Young, 72), Skerry (Starkey, 82), Luff, Sparks.